Calisthenics: Are They Missing From Your Routine? When I hear calisthenics, the first thing that comes to mind is my elementary school P.E. class. Mr. Judkins is a dude I will never forget, the biggest Tennessee Volunteers fan you’d ever meet and said his days of the week with a “dee” instead of “day”. Mondee we did arm circles, bear crawls, pushups and sit ups. Tuesdee we did arm circles, bear crawls, pushups and sit ups. And you can guess what we did Wednesdee, Thursdee, and Fridee. 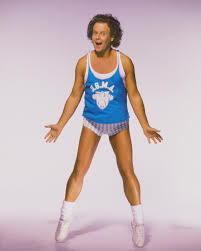 Calisthenics also remind me of those 80’s aerobic videos with Richard Simmons, Can I get an inhale and sizzle?? That being said, people neglect important body weight exercises because they require mobility and core stability which are common weak areas. Calisthenics aren’t flashy or necessarily fun exercises to do, but they help lead the way to reaching true peak performance. Calisthenics are rhythmic body-weight exercises that incorporate a variety of gross motor movements. Calisthenics improve relative body strength and control through the natural movement patterns; pulling, pushing, bending, jumping, or swinging, using only the body as resistance. Body weight training and dynamic warm-ups are most common ways calisthenics are incorporated into routines. For this blog, I want to focus on the dynamic warm-up. Every day I see people come into the gym, walk on the treadmill for five minutes, do a couple toe touches and think they are ready to knock out 4 sets for 5 on the bench press. A good warm-up should be full body with a focus on all movement planes, working from the ground up. I like to do each stationary movement for twenty seconds and the dynamic movements for 10-15 yards. Give some of these a try and see what you think. If you have any questions about some of the movements or want some help developing your own warm up routine that best fits your needs feel free to ask or email! Make your Fridee workout just as good as your Mondee and incorporate calisthenics into your exercise routine, your body will thank you ?